Swollen Baggy Eyes? Quick Cure - Samples Available!! If you have swollen baggy eyes, puffiness or crepey under eye skin, this temporary solution might help you. Watch the video below and you'll see why people love this eye tightening serum! 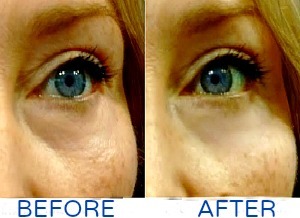 The Instant Eye Tuck serum was used as a quick fix for puffy eyes. But my issues also include little crepey lines under the eyes. I have to tell you........it works great for me! This serum really helps improve the appearance of wrinkles and puffiness. Notice how the crepey skin under the eye looks smoother in the after picture? I know it's a subtle change, but I'm happy with my results! 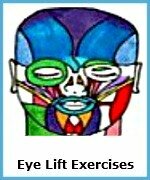 For over 20 years I've been searching for something to help improve swollen baggy eyes! I've tried serums, home remedies, makeup tricks, and eye creams - including the popular Eyeliss - and was ready to give up because nothing produced visible results. I thought what the heck! It might be worth a try. So far this has given the most dramatic results to lessen the appearance of baggy lids and reduce that tired swollen look. It starts to work in less than 10 minutes, and lasts (without tightness, dryness, or irritation) all day/night. Once absorbed, it forms a protective film across delicate eye tissue, causing it to contract. This is the most important step. This soft, pliable gel-like serum can help lift and firm the crepey skin under the eyes and reduce that puffy under eye look. Here is the suggested application. Feel free to experiment to see what works best for you. Apply your normal products - sunscreen, moisturizers, or makeup. Let them absorb for about 10 minutes. Then dispense a pea size drop onto your finger and gently/lightly sweep across the swollen, baggy lower eyelid area. In about 5 minutes you'll feel it firming the whole area. And that's it. You're done and looking fabulous. The effects last all day or night and the ingredients help firm and protect the underlying tissues. This step is optional. But if you have dark discoloration around the eyes, consider using the Illuminator cream first. 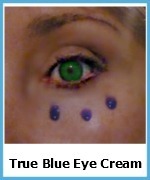 NOTE: This is NOT a concealer, but a moisturizing cream that helps brighten the whole eye area. Massage in a small amount of the Illuminator under the swollen area and in the inner corners of the eyes. Concentrate on the areas that are discolored - like redness or dark circles. NOTE: I like to put a little on my upper my upper cheeks, upper lids, and brow area. It helps brighten the whole face. Once the Illuminator has been applied and absorbed you can apply the Eye Tuck serum. For prices and more info - click here....Easy Eye Solutions Instant Eye Tuck. While the Easy Eye Tuck Solution won't get rid of bags completely, it will significantly lessen their appearance. If you have swollen baggy eyes or just crinkly skin in the under eye area, you might want to this hydrating-firming serum. Most people love it. But if not, you can always return it.